Aloha from the beautiful island of Kauai! Hawaii and in particular the Garden Isle of Kauai are known for their inspirational qualities. I can attest to that. I moved to Kauai in 2013 following my heart as well as wanderlust. I chose a humble writing abode in Lihue to complete my inspirational memoir, When All Balls Drop: The Upside of Losing Everything. With such an emotional and personal topic, I needed moments away from my Macbook. Ok, I sometimes needed days away to clear my thoughts. I went straight for nature's inspiration on the NaPali Coast and its hiking trails. Nature has a way of de-cluttering thoughts, which helped me polish my powerful story. I released When All Balls Drop in September of 2014, which was highlighted in Looking Up, an article from the Garden Island newspaper. Since its launch, I have been writing a sequel, With New Eyes, from my Lihue home, but not without the needed breaks for inspiration. That is why I'm attending this year's Kauai Writers Conference May 1-3. Although I'm a published author, there is always something to learn and finesse about our craft as writers. You can learn more about the line-up of best-selling authors, editors, literary agents, and self-publishing pros that will be in attendance on the Kauai Writers Conference website as well as this brief video. Do you need another reason to visit paradise? 1) Kauai is a spectacular destination for outdoors enthusiasts as well as creative spirits. There is no better place to write a book or plant the seeds of your next one. 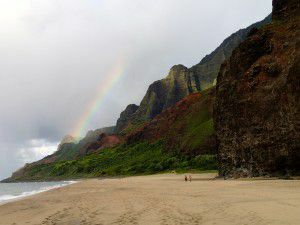 Check out my article on Kauai's Best Kept Secrets. 2) The organizers of the conference are extending a FREE CRITIQUE with registration before March 15. Yes, you will be able to submit ten pages of your manuscript to one of two publishing industry pros: Literary Agent Elizabeth Kracht and/or Editor Silissa Kenney. To sign up for the conference and the free critique, email or call 808-639-4638. I'll be looking for you at the Kauai Writers Conference. Give me a heads up that you are coming by connecting with me on Facebook and/or Twitter.